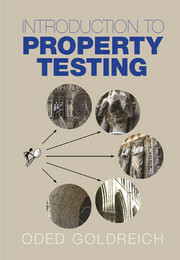 A tad less than one year and a half ago, we announced on this blog a then-upcoming book on property testing, by Oded Goldreich. Now, just in time for the Holiday season, or for perusing on the beach if you live in the south hemisphere, the book is out! An extensive and authoritative introduction to property testing, the study of super-fast algorithms for the structural analysis of large quantities of data in order to determine global properties. This book can be used both as a reference book and a textbook, and includes numerous exercises. See the book’s website for more resources and the (detailed) table of contents. This entry was posted in Surveys and books on November 26, 2017 by Clement Canonne.